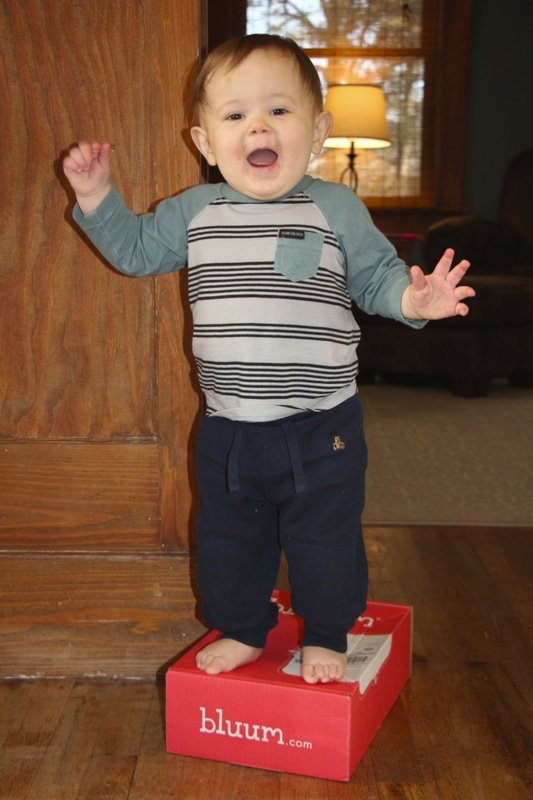 Bluum box makes a good step stool, right mama? What was in Bluum Box March 2014? 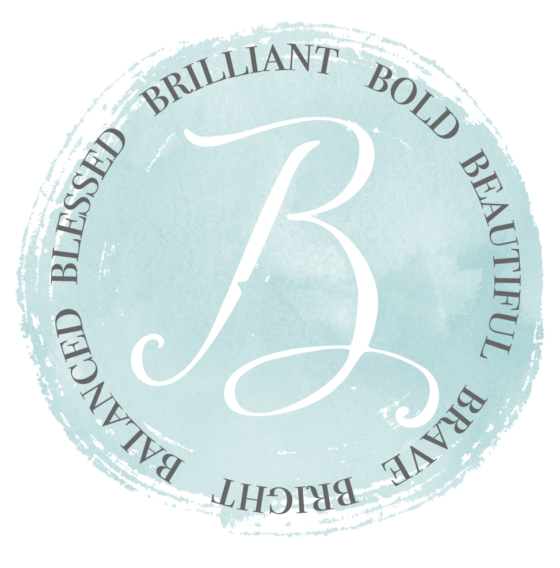 I carefully chose Bluum Box based on their ratings and other mommy blog reviews, so do your due diligence to make sure this subscription box is a good fit for your family before shelling out the cash! You can also read more about Bluum Box at their website here. 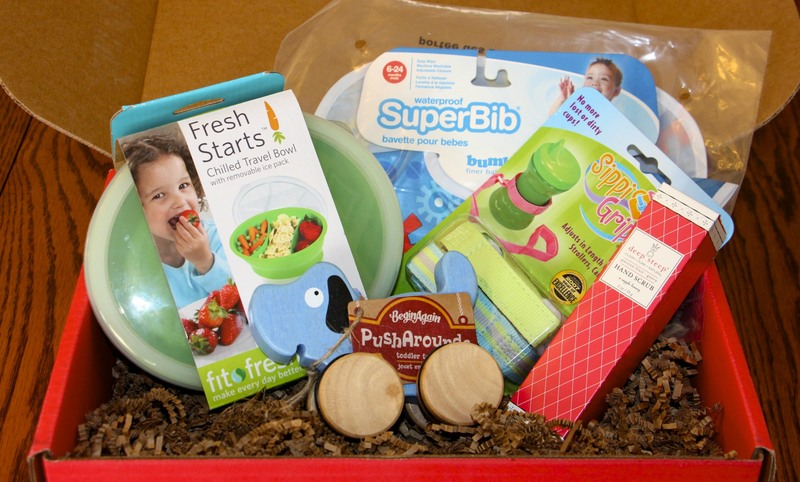 Bluum Box is a monthly subscription box service. They hand pick new goodies for mommy and kiddos ages 0-5. The content in each box is based on the age, gender and developmental stages of your child. 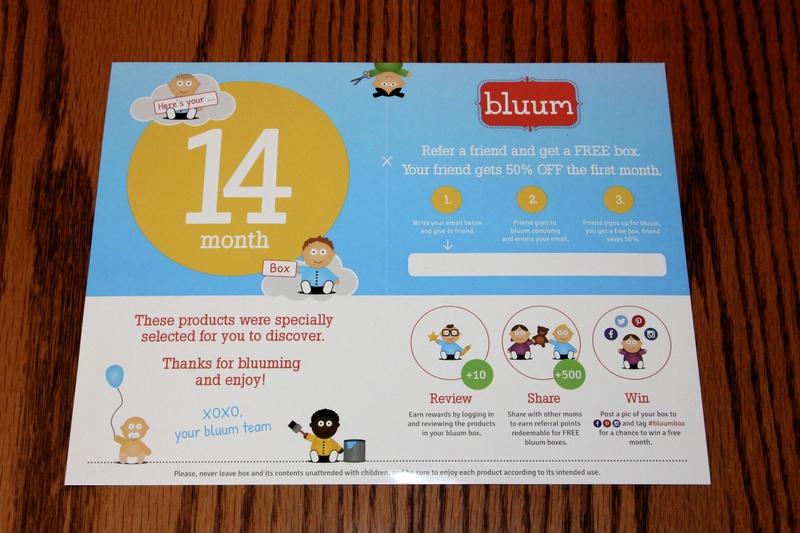 Bluum Box also features a really stellar and easy-to-use referral program, one of the best I have seen so far. Refer Bluum Box to friends and family, and you will receive FREE boxes in return. PLUS they have a neat points system with opportunities to earn free boxes by accruing points via leaving product reviews on their website and posting a picture of your box on social media. So what was in our box? *Note: My price comparisons reflect the best bargain per item that I can find on the internet in order to determine if the Bluum Box is truly worth the cost. We received the email that our box shipped on 3/12. We just received it today 3/22. They included a large cardstock note that outlines their referral program, and what age the box is geared toward. № 1. 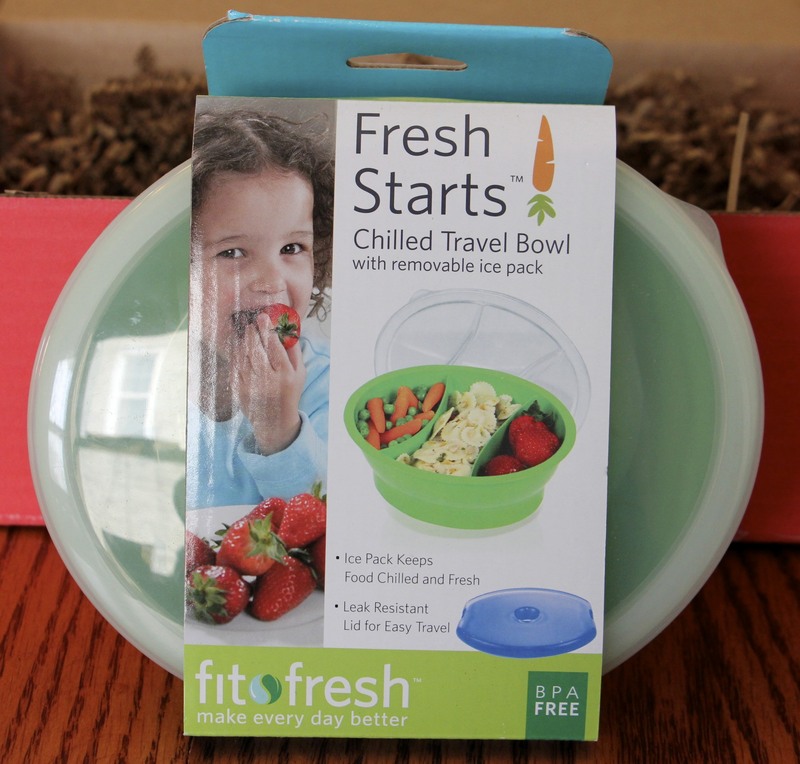 Fresh Starts Chilled Travel Bowl ($8.99) New brand alert for mommy! I am absolutely in love with this concept, removable ice pack sits in the bottom to keep a meal chilled. No more lugging along a cooler on the shortest of outings! Leak resistant, three separate compartments (holds two cups total), BPA Free. A+++ on this one, Bluum box! № 2. 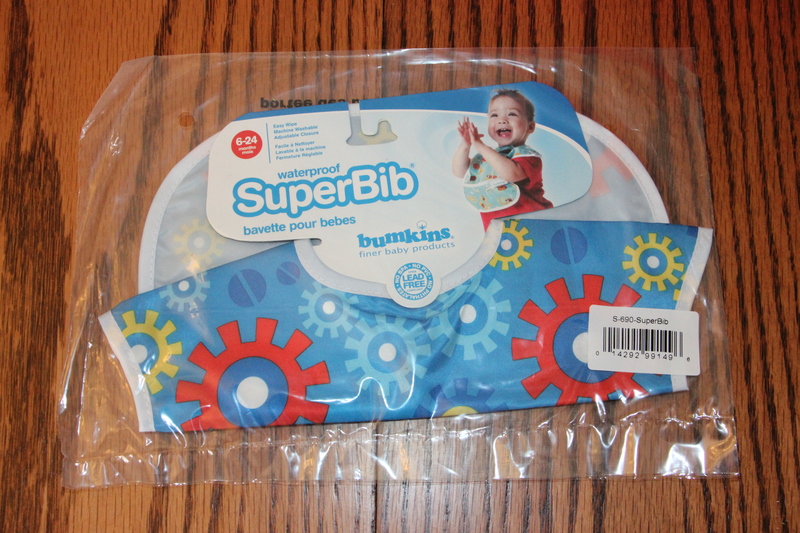 Bumkins Waterproof Super Bib ($6.95) 6-24 Months. Okay, seriously. It’s like Bluum read my mind – I was JUST about to order one of these awesome bibs from Amazon. We had the Bumkins starter bib for Liam and it was just perfect. So lightweight, took up next to no room, washed up easily and dried fast. Kept one in the diaper bag, and Liam just recently outgrew it – hence the need for the bigger one! Also has a pocket to catch food, a must have. The gears design is too cute as well! № 3. 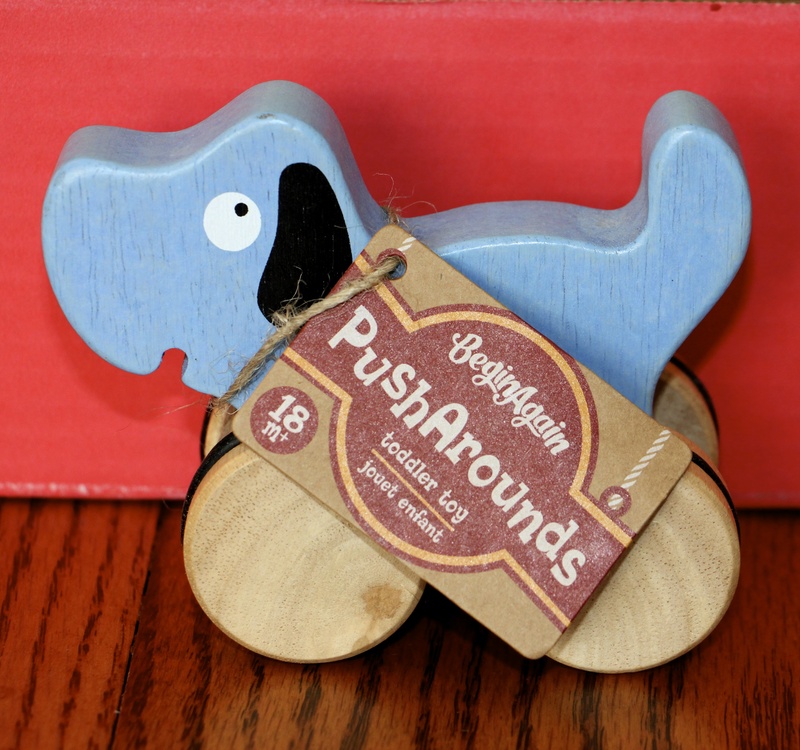 BeginAgain PushArounds Dog Toddler Toy ($13.00) 18 Months+. Another new brand alert for mommy! I really love eco-friendly wooden toys for babies because they are natural teethers. This one fits the bill perfectly, made from earth-friendly rubberwood. Also promotes development of fine motor skills, because it fits nicely in little hands and rolls very easily – kept Liam’s attention because it moves without much effort. Another winner, very cute! № 4. BooginHead Sippi Grip – Set of 2 ($15.99). Award-winning. I recently researched BooginHeads pacifier grip for next baby, so I knew what adorable fabrics this brand comes in. 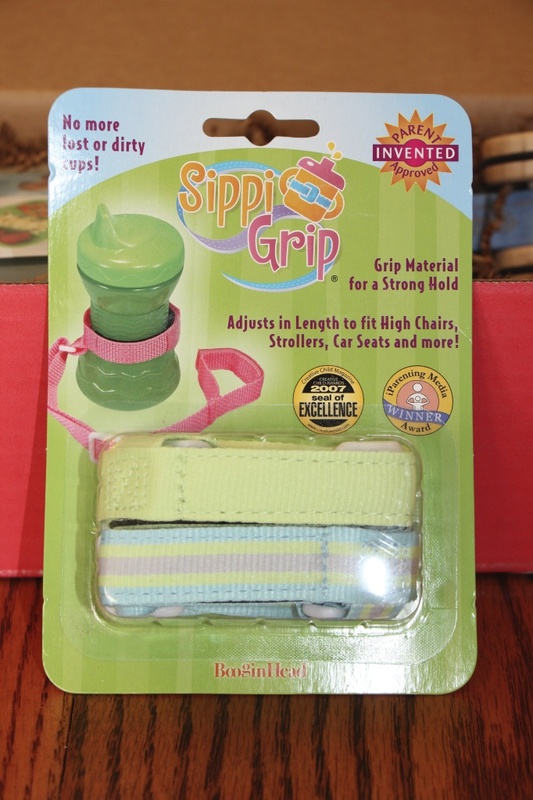 Very pleasantly surprised to see the Sippi Grip in our box! Cannot wait to try it out, perfect to secure teethers, toys, bottles and cups to a stroller or chair, keeping items from getting lost or dirty. In all, I received five items with a total value of $50.82. I have purchased the annual subscription, so I paid $18.98 for each box. Bluum Box knocked it out of the park this month! I was super excited about every single product in this box, and was introduced to three brand new brands. Can’t wait to see what next month has in store! What was in your March 2014 Bluum box? If you are interested in trying out Bluum Box, sign up here for 50% off your first box via my referral link! I really love this perk for new users. If you are on the fence, it is a great way to test drive this subscription box service without paying a premium price. Have a blessed day and thank you for reading!